Join us for a LIVE VIDEO show every Tuesday at 10amPT/1pmET where you will be able to ask questions and weigh in on topics of discussion with your co-hosts Susan Knowles and Bill Cloud. 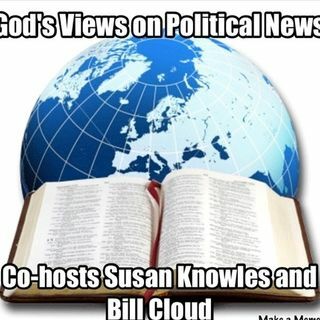 All you need to do is follow the link to the GOD'S VIEWS ON POLITICAL NEWS page on Facebook. You can also get to the Facebook page by clicking on the show Logo. Each week we'll take your questions LIVE ... See More during our discussion and hopefully bring you some clarity on what is happening from a Biblical perspective as well. It will be a fascinating hour delving into God's Word and understanding that most of what we are witnessing in news and politics today has more to do with a spiritual battle than anything else. Bill Cloud was raised in a traditional Christian home in South Georgia. After being born again, Bill immediately developed a hunger for the Word of God and in particular the Hebraic perspective of the Bible. Bill began studying Hebrew under the tutelage of a local rabbi and has spent many hours studying, not only the Hebrew text, but the Hebraic roots of Christianity as well. This research has been rewarded with a keen insight into Biblical Judaism and its relationship to Christianity. For five years, Bill and his wife Beth served as Youth Pastors in Central Florida. For over three years, Bill served as chief researcher, writer and Publications Director for Perry Stone and Voice of Evangelism Ministries. In May 2000, Bill and his wife, Beth, founded Shoreshim (Hebrew word for “roots”) Ministries. Bill is a featured speaker in venues throughout the country and has appeared with notable teachers such as Jonathan Cahn, Perry Stone, Mark Biltz, Hal Lindsay, John Hagee and Chuck Missler. He has also made several appearances on a variety of television broadcasts seen on TBN, Daystar, and Inspiration. Bill and his family reside in Cleveland, Tennessee. Susan Knowles is a licensed psychotherapist, former practicing Family Law attorney, online conservative radio talk show personality and producer at Stand For Truth Radio. Susan is also the author of a popular children's book, "My Ears Are Not Like Yours" available on Amazon. She has appeared as a guest on The Glenn Beck Show, The Pat & Stu Show, The Doc Thompson Show and The Rick Amato Show on One America News Network. Additionally, Susan is a former Contributor to TheBlaze.